Take care not to wish your French acquaintances “happy Bastille day” on July 14th, however, as this term is not used by the French to refer to their “national day!” Although the date was chosen to commemorate the storming of the Bastille prison, said to have ignited the French Revolution on July 14, 1789, the term “Bastille day” is used only by non-French Anglophones—for reasons not well understood, at least not by anyone I polled! There will be parades in the larger French cities today and I had a birds-eye view this morning of “the big one” down the Champs-Elyseés in Paris. The same holds true for fireworks displays, called les spectacles des feux d’artifices. 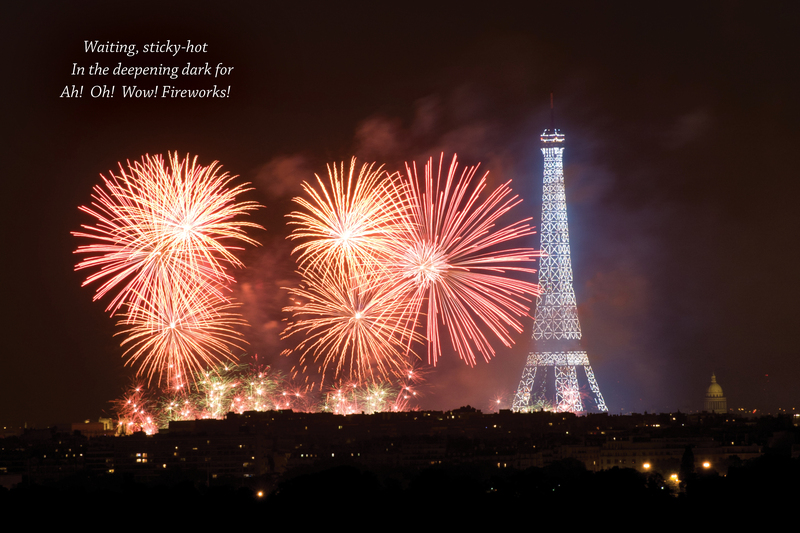 Tonight there will be a huge fireworks spectacle along the Seine River, near the Eiffel Tower, from 11 pm to midnight. But, there won’t be an overabundance of French flag-waving among the French spectators, because your neighbors might think you are showing your support for far-right conservative political parties! Taken at midnight on the 14th of July a couple of summers ago, the fireworks photo below is still a favorite in my collection. This “grand finale” photo was shot from the plateau-like scenic overlook on Mont-Valérien in Suresnes, about 5 miles west of Paris, across the street from the entrance to the visit-worthy American Military Cemetery and Memorial (with over 1500 graves of American service personnel who died in France in WWI).